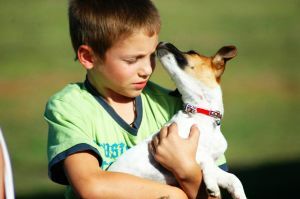 How Do Dogs Help Autistic Children? Sheffield based Support Dogs, one of the UK’s leading charities dedicated to training assistance dogs, in February of 2008, launched a £1 million appeal to help it to introduce a unique national initiative to provide dogs specially trained to help children with Autism.This programme, the first of its kind in mainland UK, aimed to raise £1 million which go toward enabling the organisation help hundreds of people affected by Autism. Support Dogs trained the UK’s first Autism Assistance Dog with the support of Irish Guide Dogs, which has run a successful programme in Ireland for over three years. Lacey (a yellow Labrador) has been partnered with Paula Craik and her 5 year old son Joe (who live in Dundee) and in the last year has made a tremendous difference to their lives. Following on from this success, the charity announced plans to make this life changing initiative available to families across the UK. It is estimated that over 500,000 people in the UK are affected by Autism, a lifelong developmental disability that affects the way a person communicates and relates to the people around them. Over 72,000 of these are children between the ages of three and 10 years old who could benefit from a specially trained Autism Assistance Dog. Angela Gregory, Support Dogs’ Marketing and Fundraising Officer, said at the launch of the fund raising appeal:” We are very excited to be able to announce the launch of the first national Autism Assistance Dogs initiative in the UK.“We have set ourselves an extremely ambitious target of £1 million, to fund the first four years of the programme, but achieving this will allow us to provide a truly inclusive national service with no regional restrictions, which will see us training 40 dogs every year by 2012. · Improved safety levels for children with autism through control of the child by commanding the dog which acts as an anchor.· Improved behaviour and socialisation skills through acting as a constant companion and forming a unique bond. · Creates freedom for the child and family to go out from the home, allowing full public access – shops, restaurants, hotels and schools. · Expands the child’s capabilities to experience more from life. · Calms the child thereby increasing attention span and improving aptitude for learning. · Reduces stress for all family members. · Teaches the child responsibilities. · Positive changes in behaviour, lower aggression level and comfort when upset. “In our opinion this experience puts Support Dogs in a unique position to move into the field of Autism Assistance Dogs. The Autism Assistance Dogs programme is totally free of charge to all applicants however Support Dogs receives no government funding and relies on donations and bequests to fund its life transforming work. The role of dogs in helping autistic children has been much heralded in recent years.